This glorious cascading waterfall originates from the South Alligator River, across the Arnhem Land escarpment, and is well worth a visit. The turn off to Twin Falls is located approximately 45kms south of the township of Jabiru along the Kakadu Highway. From here it is approximately another 50kms of unsealed corrugated gravel road to the Garnamarr Camping area. Twin Falls is located in the World Heritage listed Kakadu National Park. This glorious cascading waterfall originates from the South Alligator River, across the Arnhem Land escarpment, and is well worth a visit. The turn off to Twin Falls is located approximately 45 kms south of the township of Jabiru along the Kakadu Highway. From here it is approximately another 50 kms of unsealed corrugated gravel road to the Garnamarr Camping area. At this point only high clearance 4 wheel drive vehicles can continue. It is another 10 km drive along a narrow winding track which has several soft sandy patches and creek crossings. Jim Jim Creek crossing is usually between 400 mm and 600 mm however has been known to reach up to 800 mm! This crossing has a firm concrete base and a snorkel is highly recommended. Allow two hours one way and ensure you have a well-equipped 4 wheel drive vehicle and drive to the conditions. Access to Twin Falls is truly unique allowing ample opportunity to fully appreciate the dramatic landscape which water today continues to shape. On arrival to the Twin Falls Car Park, Visitors are treated to a tranquil cruise up Twin Falls Creek. The boat landing is a short walk from the Car Park. On disembarking the boat there is a marked track (1km return) over boulders, sand and a floating boardwalk, which leads to a beautiful white sandy beach and plunge pool. Kakadu National Park grade this walk as Moderate. Unfortunately swimming is restricted at the plunge pool and in the creek due to the risk of Crocodiles however there are showers available to cool off under which are located on the boardwalk. Kakadu National Park recommend to allow 2 hours to complete the cruise and walk (return) and be sure to take plenty of water with you! If you are feeling adventurous, physically fit and well prepared, you may like to hike to the top of the Arnhem Land escarpment undertaking the Twin Falls Lookout Walk. 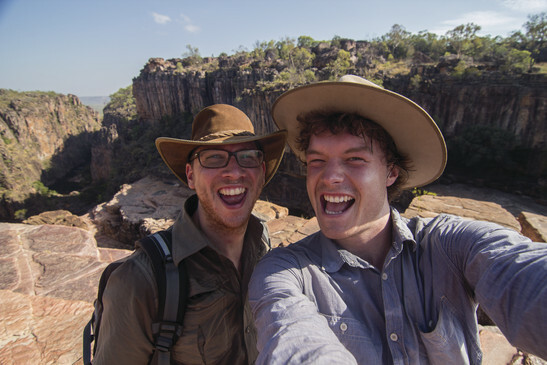 This is a steep 6km return hike, which Kakadu National Park grade as moderately difficult along a marked track. You will be rewarded for your efforts with a breathtaking view of the gorge below and most importantly if you follow the creek for approximately another 1km you will be able to take a refreshing dip in the rock pools upstream! Carry at least 3 litres of water per person and keep the markers in sight. Distance: Turn off to Twin Falls is approximately 45 km from Jabiru Township along the Kakadu Highway. It is a further 50 km’s to Garnamarr Campground on unsealed at times highly corrugated road and an additional 10 km high clearance 4 wheel drive vehicle only track to the Twin Falls Car Park. Camping: Garnamarr Campground is open 6:30am to 8:30pm during the Dry Season. Facilities include hot showers, toilets, wood barbeques and picnic tables. No generators. Suitable for tents and off-road camper trailers. Fees: $10 per person, per night. Under 16yrs free. No bookings.